(2:40 p.m. EDT) -- People with deposits down on Virgin Voyages' first sailings aboard Scarlet Lady now have a better idea of where they'll be visiting when the ship launches in 2020. 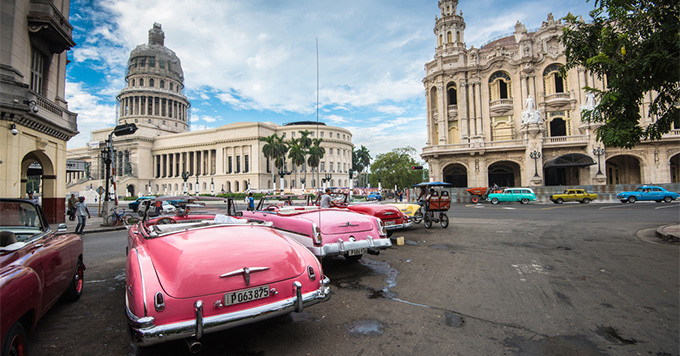 The line has revealed it will include a visit to Cuba as part of its previously revealed Caribbean itineraries. All Cuba sailings from Miami will feature an overnight stay in Havana, while OFAC-compliant shore experiences are in development; details will be made available later in 2019. "Virgin Atlantic has been visiting Cuba for 13 years, and I cannot wait to see our iconic Scarlet Lady gleaming in the Havana Harbor," said Virgin Group founder Sir Richard Branson. "Havana is the perfect place for our sailors to go and experience a city that exudes an irresistible energy and passion." According to a statement from the cruise line, the decision to sail to Cuba was influenced by customer and travel partner research conducted in North America and the United Kingdom. "We are thrilled to share the news about our partnership with Cuba and can't wait to take our sailors to Havana, which is without doubt, one of the Caribbean's most authentic and enriching destinations," said Virgin Voyages' president and CEO Tom McAlpin. "This fantastic place offers the chance for our sailors to create their own unique stories as they uncover cultural treasures, meet the locals and just soak up the atmosphere." Specific sailing dates relating to Virgin Voyages' visits to Cuba will be released when bookings open for sale next year. Scheduled for delivery in 2020, the adults-only Scarlet Lady will sail from Miami and feature a "Vitamin Sea" concept, which focuses on passenger wellness, relaxation and fun. Public spaces will include a tattoo studio, outdoor fitness center and extensive spa facilities.